CulinarySchoolsU provides a convenient selection of the best schools and programs that teach world-class culinary techniques and are tailored to students’ interests, goals and specializations. For individuals wanting to focus on cooking and restaurants, CulinarySchoolsU offers basic and advanced courses in cooking, pastry, and kitchen skills, or in food safety, storage and preparation. The website also lets students explore becoming a chef, with a specialty or culinary degree, or completing a management program in foodservice, hospitality, restaurant, gaming and casino, or tourism and travel. CulinarySchoolsU is a one-stop resource center and the first step in launching people’s culinary careers. 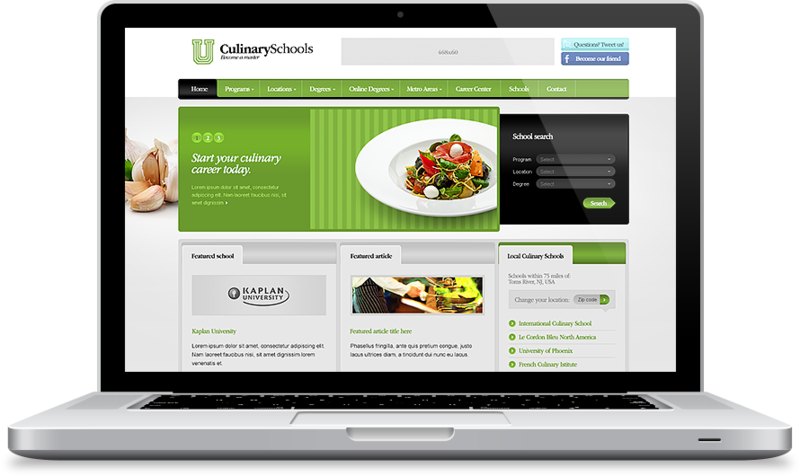 INCORE rejuvenated CulinarySchoolsU’s online appearance. With the fresh design and logotype, we wanted to illustrate the website’s resourcefulness and identity, while making the browsing experience easy, convenient and friendly for the users. The art of refreshing a logotype is very fine, but a change is often needed for continuous success. Our goal was for the new logotype to continue conveying CulinarySchoolsU’s originality and heritage, while remaining warm, simple and catchy.